If you've previously installed Visual Studio 2017, use the Visual Studio Installer to ensure that the Office/SharePoint development workload is installed. 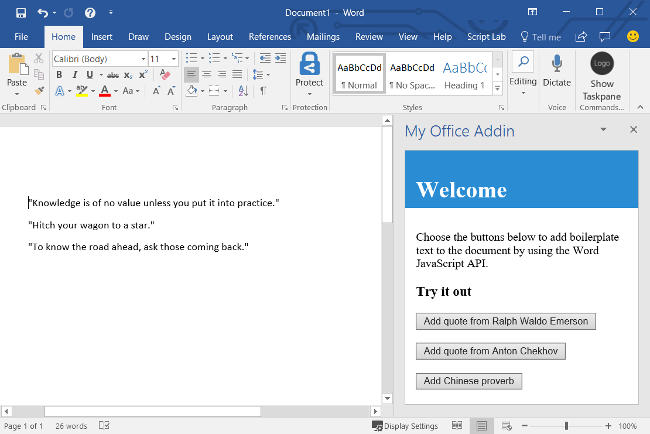 If you don't already have Office, you can join the Office Developer Program to get a license to do your development and experiment with add-ins. On the Visual Studio menu bar, choose File > New > Project. In the list of project types under Visual C# or Visual Basic, expand Office/SharePoint, choose Add-ins, and then choose Word Web Add-in as the project type. Visual Studio creates a solution and its two projects appear in Solution Explorer. The Home.html file opens in Visual Studio. Home.html specifies the HTML that will be rendered in the add-in's task pane. In Home.html, replace the <body> element with the following markup and save the file. Open the file Home.js in the root of the web application project. This file specifies the script for the add-in. Replace the entire contents with the following code and save the file. // Use this to check whether the API is supported in the Word client. // Just letting you know that this code will not work with your version of Word. // Queue a command to insert text at the start of the document body. // Queue a command to insert text at the end of the document body. Open the file Home.css in the root of the web application project. This file specifies the custom styles for the add-in. Replace the entire contents with the following code and save the file. Open the XML manifest file in the add-in project. This file defines the add-in's settings and capabilities. The ProviderName element has a placeholder value. Replace it with your name. The DefaultValue attribute of the DisplayName element has a placeholder. Replace it with My Office Add-in. The DefaultValue attribute of the Description element has a placeholder. Replace it with A task pane add-in for Word. Using Visual Studio, test the newly created Word add-in by pressing F5 or choosing the Start button to launch Word with the Show Taskpane add-in button displayed in the ribbon. The add-in will be hosted locally on IIS. 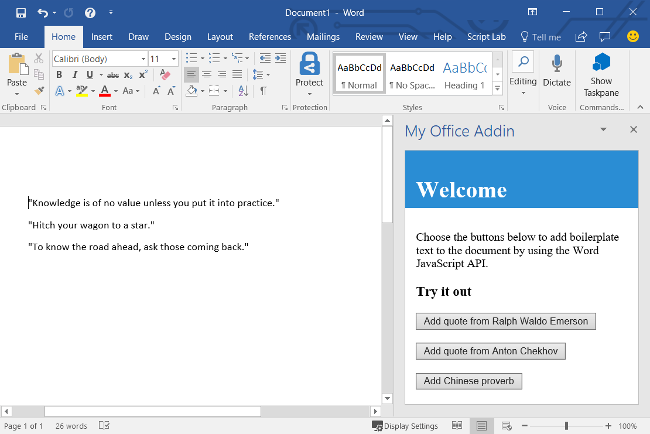 In the task pane, choose any of the buttons to add boilerplate text to the document. Navigate to the root folder of the project. In your code editor, open index.html in the root of the project. This file contains the HTML that will be rendered in the add-in's task pane. Replace the <body> element with the following markup and save the file. Open the file src/index.js to specify the script for the add-in. Replace the entire contents with the following code and save the file. 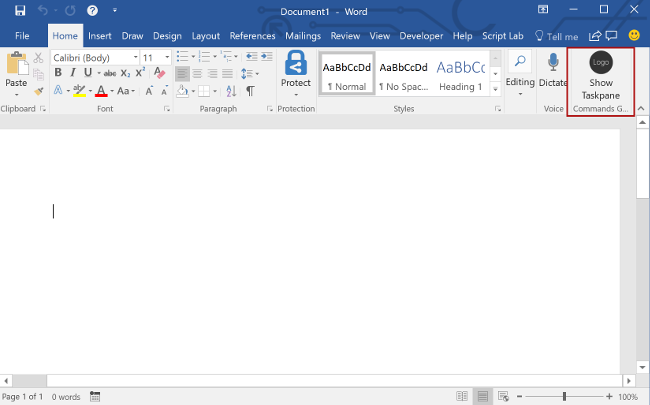 This script contains initialization code as well as the code that makes changes to the Word document, by inserting text into the document when a button is chosen. Open the file app.css in the root of the project to specify the custom styles for the add-in. Replace the entire contents with the following and save the file. Open the file manifest.xml to define the add-in's settings and capabilities. Open a bash terminal in the root of the project ([...]/My Office Add-in) and run the following command to start the dev server. Open either Internet Explorer or Microsoft Edge and navigate to https://localhost:3000. If the page loads without any certificate errors, proceed to the next section in this article (Try it out). If your browser indicates that the site's certificate is not trusted, proceed to the following step. Office Web Add-ins should use HTTPS, not HTTP, even when you are developing. If your browser indicates that the site's certificate is not trusted, you will need to add the certificate as a trusted certificate. See Adding Self-Signed Certificates as Trusted Root Certificate for details. To sideload the add-in within Word, follow the instructions for the platform you'll use to run your add-in. 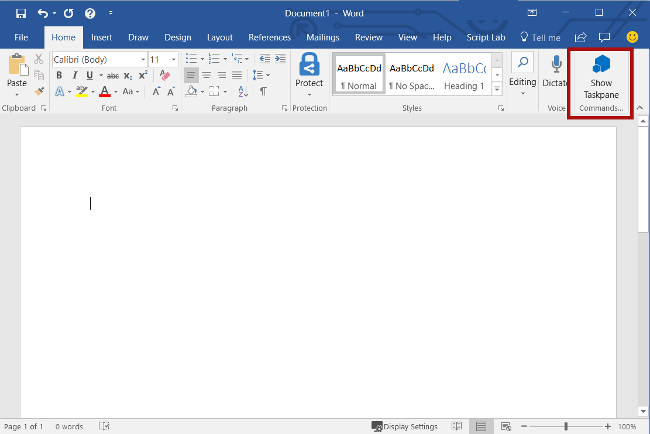 In Word, choose the Home tab, and then choose the Show Taskpane button in the ribbon to open the add-in task pane. Congratulations, you've successfully created a Word add-in using jQuery! Next, learn more about the capabilities of a Word add-in and build a more complex add-in by following along with the Word add-in tutorial.